Art UK is the online home for art from every public collection in the United Kingdom. Art UK already features over 200,000 oil paintings by some 38,000 artists. These artworks are in museums, universities, town halls, hospitals and other civic buildings across the United Kingdom. Later in 2016 we will be expanding the project to include watercolours, pastels, drawings and prints uploaded by collections. And in 2017 we aim to add sculptures. A key aspect of the project’s mission is to engage as wide an audience as possible in contributing to the project. We have done this through a tagging project in which the public helped to tag paintings to make them more searchable. We have also achieved this by asking people to offer up valuable specialist knowledge about the artworks on Art UK throughArt Detective. The Art UK project started in 2003. At that point we were called the ‘Public Catalogue Foundation’, which remains the legal name for our charity. Our initial focus was to make the UK’s publicly owned oil paintings accessible through a series of county-by-county printed catalogues. Early on it was acknowledged that this project would need to go online and an approach was made to the BBC to become the project partner in this online venture. This became the Your Paintings partnership and theYour Paintings website was launched in 2011 and was hosted on bbc.co.uk. Your Paintings was a great success. Its success proved that collaboration between public art collections, the BBC and us was an effective force. It also confirmed the potential for using a shared digital infrastructure to make other art accessible to global audiences at a time when the vast majority of public collections could not do this on their own. To ensure long term-sustainability, we and the BBC decided we needed to builda successor to Your Paintings off bbc.co.uk. Hence the idea for Art UK was born. The idea was that Art UK would be a shared digital platform for all 3,000 + public art collections across the UK – not just museums but also university, hospital and council collections as well as institutions such as the National Trust, Government Art Collection and English Heritage. Important private collections such as those of the Oxbridge Colleges would be displayed. It would be operated byus but still very much in partnership with the BBC, who would create editorial using Art UK content and bring audiences to Art UK. An application was successfully submitted to Arts Council England for the majority of the costs of building Art UK. Additional funding was provided by the Scottish Government. Guided by a large Steering Panel of experts inside and outside the museum sector, we started building Art UK in April 2015 and launched it in February 2016. The benefits of Art UK are substantial. The overwhelming majority of the UK’s public art collection is not on display with some 80% being in store or in public buildings without routine public access. Showing art online allows audiences to find out about artworks in store whilst also encouraging visits to the art that is on display. At the same time it opens up wonderful learning opportunities. Sadly, most collections do not have the means to show their holdings of art on their own websites. Art UK constitutes a single, shared digital national platform for all public art collections that unites the benefits of scale and technology. Instead of thousands of smaller collections each aspiring to build their own collection website, it provides one sophisticated national platform. The BBC will play a key role in the Art UK initiative by curating on bbc.co.uk artworks from the platform that relate to broadcasts and topical events and sending traffic to Art UK. Art UK is designed to inspire people to leave the online world and engage with art offline. People are encouraged to see paintings in real life with easy links to institutions’ own websites and with the use of Google maps to help their journeys. 10% of our audience uses Art UK to plan visits. Art Detective addresses the serious issue of insufficient – and declining – specialist knowledge amongst public art collections. A reflection of this is that the Art UK object records vary greatly between collections and that there are significant gaps in knowledge about works. For example well over 10% of paintings do not have any firm artist attributions and at least 5,000 of the portraits do not have sitter identities. Given our broad institutional remit – which includes non-museum collections and smaller museums with specialisms other than art – it is not surprising that a large percentage of collections in the project do not have any fine art expertise. However, a feature of the last few years is that the already stretched body of expertise within museums is under further pressure. A 2013 Museums Association poll found that the number of Fine Art Curators had declined by 23% over ten years. And in the Museum Association’s July 2012 Report ‘The Impact of Cuts on UK Museums’, Gina Evans reported that research into collections was the area most likely to be de-prioritised. Our solution was a digital network that connects public art collections lacking information about their oil paintings with providers of specialist knowledge from around the world. Art Detective works in the following way. 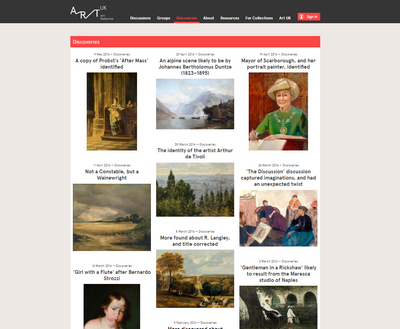 Questions from collections or suggestions from the publicare entered into the Art Detective interface, after following a link from the respective artwork page on Art UK. Volunteer contributors are invited to give information about their experience and expertise when they sign up. This may be art historical or relate to local history or topography. Contributors are encouraged to provide evidence when they make suggestions. Not all suggestions make it to public ‘Discussions’ as that is determined by the Art UK Editors.However, if they do get accepted, these Discussions are passed to one or more of the twenty-seven ‘Groups’ on the network. For example a suggestion or question about the identity of a portrait of a military figure would be passed to the Military Group as well as one of the British Portraits Groups. A Group Leader (a pro bono authority in the subject), supported by the Art UK Editors, is responsible for leading public Discussions through to a conclusion. Firm or qualified conclusions are sent to the respective collection that owns the artwork (they are prompted to follow Discussions about their works). The collections have the final say as to whether the authorised record on Art UK is amended. Anyone can follow the Discussions. Broad public involvement – and contributions – is sought. Art Detective is still very young. The principal outcome of Art Detective will be improved knowledge of the nation’s oil painting collection.